Dandelion Orange Smoothie was posted on July 2nd, 2012 and is filed under Dairy Free, Drinks & Smoothies, Recipes, Vegan. This entry has 13 comments. You can follow any responses through the RSS 2.0 Comment Feed. Happy July! Yesterday was the first day of the Smoothie Challenge and I have to say, it’s been SO fun receiving all your entries/smoothies – and it’s also been great to see people chatting with each other on Twitter about the smoothies. You guys are awesome. Just sayin’. So now we’ve seen what you all did for your first day of the challenge, but you haven’t seen what I did. I decided to get creative and try something I’ve never really tried before. I was weeding the garden the other day and I found some gigantic dandelion leaves, so I picked them and saved them for this smoothie. I also learned that dandelion is loaded with potassium, iron, calcium, choline, magnesium, phosphorus, copper, thiamine, riboflavin, vitamin K, vitamin E and the B vitamins. It also had fiber AND protein – the protein thing surprised me. Anyway, I was excited to give it a try. Note: Make sure that if your pick the dandelion leaves yourself you know they are organic and not sprayed. 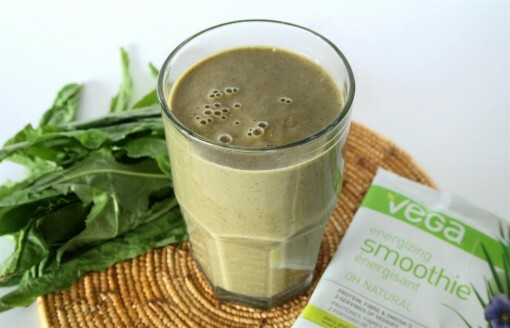 You can use whatever protein powder or superfood you like instead of the Vega mix, but I really enjoyed using it in this smoothie and found that it disguised the bitter taste of the dandelions. Also, if you really want to try and hide the dandelion taste, add fresh squeezed orange juice instead of water. This morning I woke up feeling lazy so I just shook up some Vega Berry Energizing Smoothie with water and ice. I love these smoothie pouches for this reason – no effort required. I’m doing some traveling this month, so I’ll bringing these smoothie pouches along! No blender needed. Unfortunately, I also woke up with a cold/cough. I haven’t been sick for simply ages, but lately, everything has been extremely busy and I think my body was just tired of doing so much all the time. Anyway, it’s just one more reason for this smoothie challenge. Smoothies are so amazing for healing your body. I’m also drinking hot lemon and honey, taking Cold FX and vitamin C, as well as my well-loved spiriluna. Hopefully this silly cold will go away soon! Even though I’ll be eating really healthy to beat this cold, I discovered this in the fridge today. 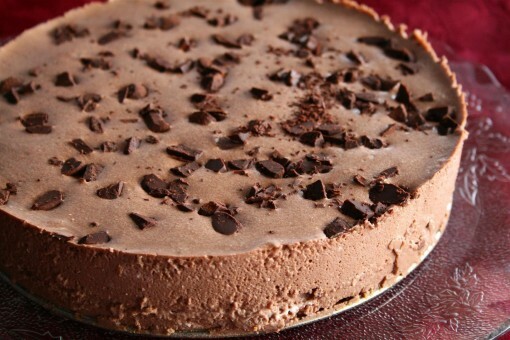 Seems like my amazing Mom has made the No Bake Chocolate Cheesecake again! There’s no way I’ll say no to that. Thankfully, it’s practically sugar free and it’s a high-protein dessert! It’s a family classic around here and it’s hard to believe there’s not a stitch of cream cheese in it. I’m glad eating healthy doesn’t mean skipping dessert! How’s the challenge going for you? Any tips for me to get rid of this nasty cold? By the way, it’s not too late to join the challenge, you can join in any old time! Sorry to hear you’re not feeling well. I take shots of lemon juice w/cayenne pepper when I have a cold. I also make sure to cleanse my nasal passages really good. That dandelion smoothie sounds wonderful. I’ll have to try it. Love Vega products. My stash is low, so I’ve got my fingers crossed that I have a shot at winning, although I’m having fun just participating in the challenge. Oh, did you notice I mentioned your challenge for the second time on my blog (http://rawdorable.blogspot.com/2012/07/dont-worry-i-didnt-forget-to-do-diy.html). I hope someone is reading it and getting inspired to drink more smoothies. Shannomarie~ That’s a great idea – I was reading about the health benefits to cayenne pepper this morning but hadn’t tried it yet! Thank you. Hope the cayenne helps. It always works for me. Oh, and thanks for including my smoothie pic in the photo collage. I pinned this…I need to go out and get some Vega smoothie packets and pick which I like most. I’ve heard such great things about Vega! there’s an example of taking something that most people complain about (dandelions) and making a positive out of it! Love it! Didn’t realize that you’re a Vega fan, too! I’m new to them – been trying different plant-based protein powders and definitely like them WAY more than others out there. Vanilla Chai’s my favorite, by far, but I haven’t been able to get my hands on chocolate – obviously VERY popular! On my list for the market tomorrow. Love the challenge – great inspiration! Sorry you’re not well. I always make a honey and lemon drink for my husband when he has a cold and it always makes him feel better. Squeeze the juice from one lemon into a mug and add equal amounts of honey. Add some fresh ginger (either grate or add a chunk) and pour hot water on it and leave it for 5 minutes before drinking. This smoothie has really inspired me. I have not yet been brave enough to pick my own greens although I have dandelions in my garden at the moment. They are the only ones I recognise. Do you know if you can eat them once they start to flower? I’m not brave enough to try the dandelions in the yard, lol. The Vega products look great will have to try them. I would never ever think to use the dandelion leaves in my smoothie. So creative! Everything looks delicious! I am just watching the challenge, not really participating but I might make one or two smoothies this month! Love it! Well I braved the dandelions in the back garden and created my own version of your smoothie. I didn’t have any Vega Powder so I just used dates to sweeten it and my usual oats to make it a meal replacement drink and pecans for extra protein. The first taste was a little bitter but the next taste was fine. Once I’d left it overnight in the fridge it was gorgeous! I only needed a small portion for breakfast as it was so filling. Many thanks for getting me out of my comfort zone.